Beets!!!! Oh, they are, truly truly one of my favorite delights of the earth. In fact, I credit beets with being the farm fresh ingredient that taught me to cook all those many years ago when I had my first CSA at Hampshire. Because I’m telling you, in the Stone Age before a million beet recipes were just a Google away, beets were a pretty lowly vegetable relegated to one and exactly one recipe only in my entire cookbook collection of 1994 (at least 5 or 6 volumes I’m sure). Borscht! So once I got tired of borscht, I had to figure out other things to do with the 10+ pounds I was getting every week from the farm. Thusly, Jen Food was born. It’s best to make this soup when you’re lucky enough to still have a bunch of beets from the week before so you can make a nice big pot. Otherwise, you have to make a half batch and then there’s not enough to share with the family at dinner time. Everybody in my house actually loves this recipe, sullen 13yo included, though the 2yo prefers to eat his with a fork. I also like this recipe with a leek if you’re lucky enough to have a leek. Notice that with such a fresh onion, I like to use all the green part as well. 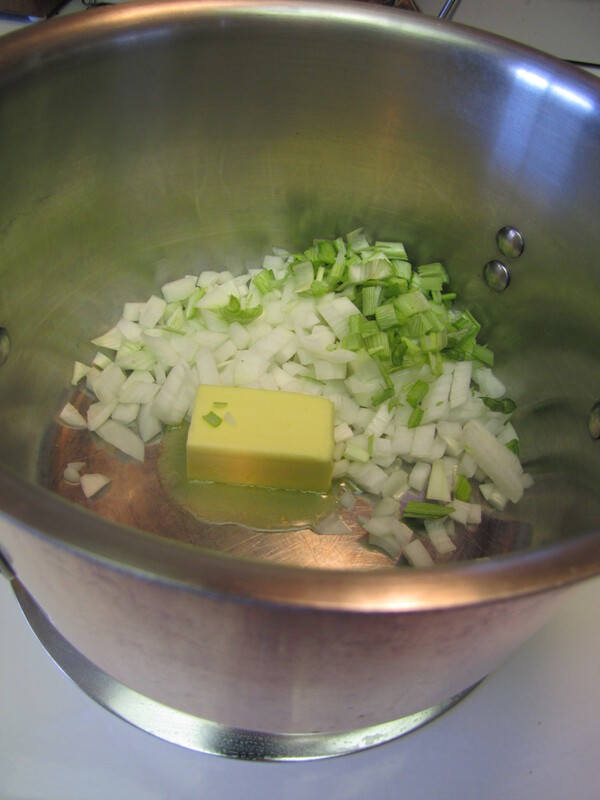 Dice the onion and cook over low heat with the butter. Using actual butter and using THE ENTIRE HALF STICK I listed in the ingredients is probably the only truly crucial thing I consider to making this recipe everything you should hope it to be. 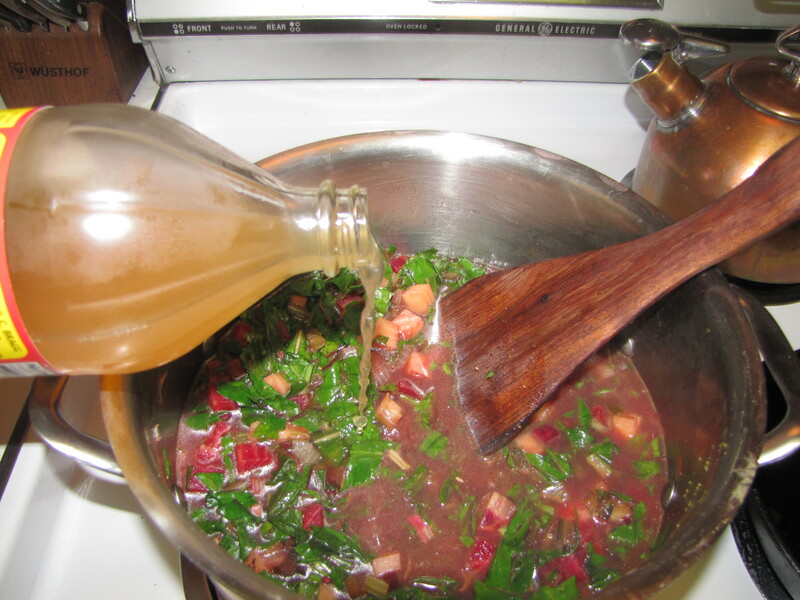 Butter has an incredible softening effect on the tannins naturally abundant in beets (especially the greens!). This makes it so you can really minimize that prickly teeth feeling that plagues beet-green-loving olive oil stalwarts around the world. 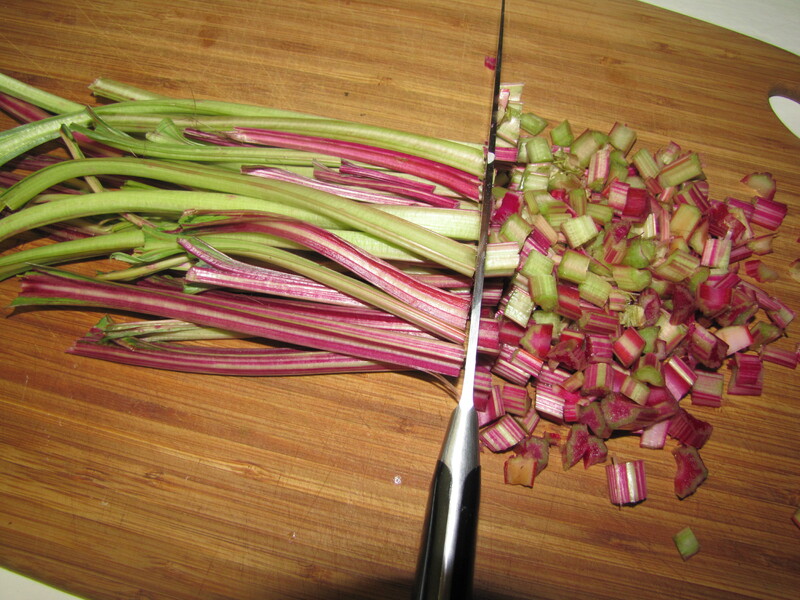 Cook for about 5 minutes while you separate the stems from the leaves and chop them up. Add the stems to the onions and butter and cook for about 5 more minutes or until onion is translucent. Now it’s time to chop up the beets. 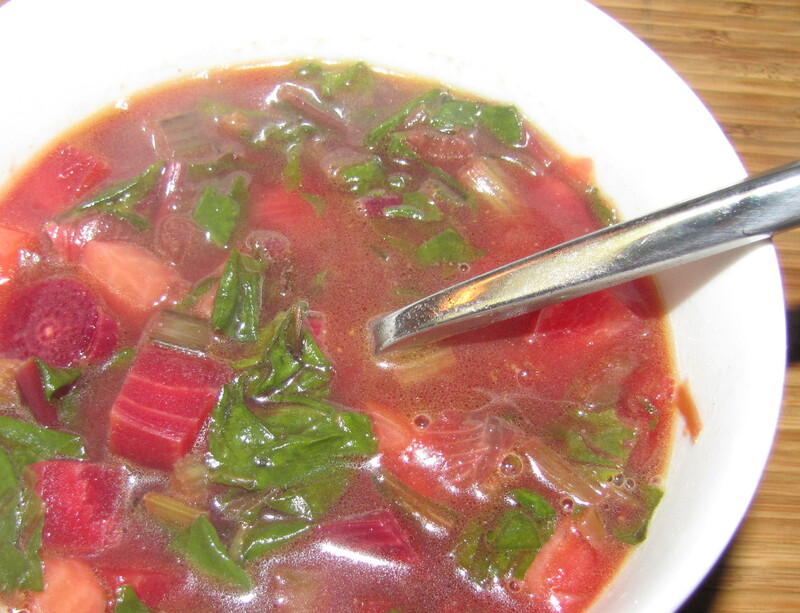 I love all the colors of beets and they all contribute equally well to this delicious soup. I might take off a brown spot or two but I by no means peel them nor do I remove that intersection between the stem and the root (why folks have prejudice against this zone is a true mystery). I also love to add turnips to this recipe, greens and all (again, if I’m lucky enough to have them). And I have been known to add potatoes, carrots, and probably even a rutabaga in a random fit of madness, but the plain beet version is so perfect I usually don’t mess around. 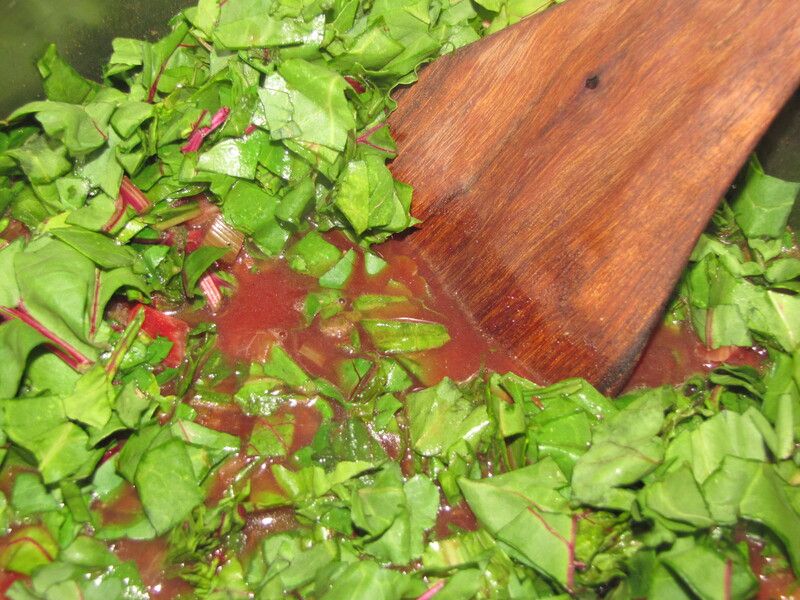 Add the chopped up beets to the pot with a couple generous grinds of pepper. Raise the heat to medium high and sauté for another minute or so before adding stock. If you don’t have homemade stock available I personally recommend the Organic Better than Boullion brand that comes in a jar. For this recipe I use half chicken and half vegetable. 8 cups should be enough to generously cover the beets. Bring to boil; reduce to simmer. 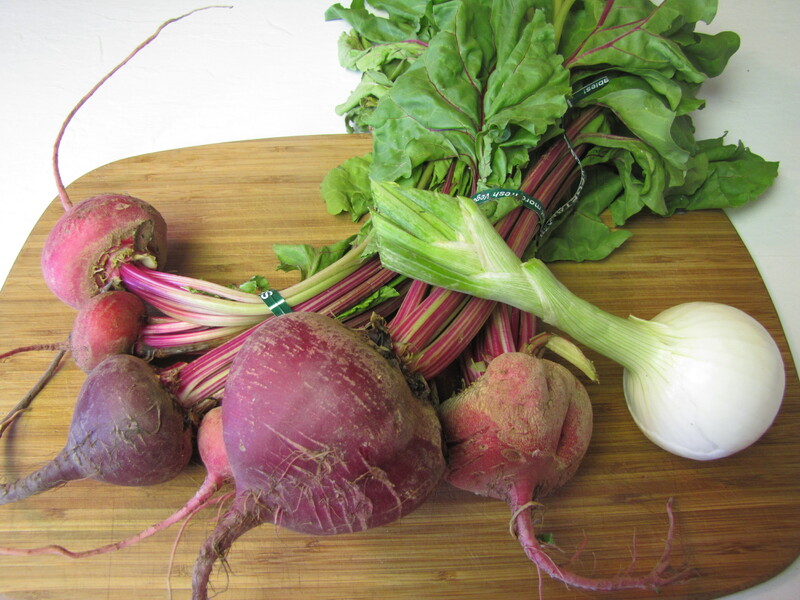 Cook for about 20 minutes or until beets are almost completely tender. Love simple recipes like this. I have but one beet left this week and have planned to juice it with some ginger later this morning.